Strasbourg's Golden Age : Beyond past Tragedies, "Paradise Garden" of a European Quatrocento, aspiring for a new Renaissance ? Strasbourg's Golden Age, at the 15th Century, its "Quatrocento", is pictured mainly in 2 contrasting paintings, reveals Expo "1400" : Tragedy against Splendor : Christ's Crucification by a dominican painter, doesn't hide the atrocities of blatant cruelty. But "Paradise Garden" ("Le jardin de Paradis"), on the contrary, strikes by its beautiful, calm, intelligent, light colours, depicting the bright side of an opulent and human everyday life, among a luxurious Nature, typical of Alsace's fertility. 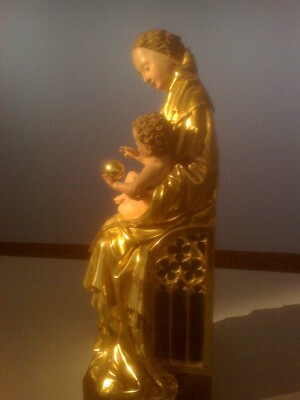 What relation between a so-called "Gothic" Art and the famous Italian "QuatroCento" ? 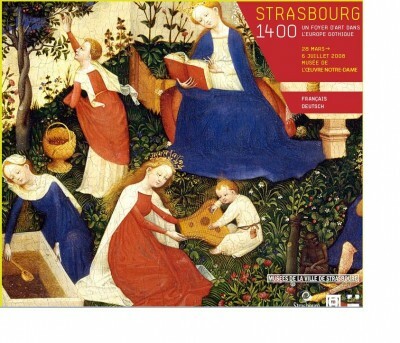 From Rome to Wiena, Frankfurt, Karlsruhe, Koeln, Fribourg, Swiss Bern, and other cities, linked by rivers, lakes and seas, various artists cooperate in forging Strasbourg's original European style : It's precisely in 1423 that Strasbourg's cathedral became, for the 1st time, Europe's highest peak. But finally, the brightest light, in sculptures and paintings, appears at a Mother's all too Human way to look after her beloved baby or child : In the way she holds it in her hands, plays together, or offers a flower out of a book's wisdom, etc. : A prefiguration of what became later Europe's Capital for Human Rights ? And may be, that's the point : Paradoxically, Strasbourg was called, then, "Argentina", from the Latin "Argentoratum", i.e. the "Silver City", as if it postponed its "Golden Age" for a Future time : Half a Millenium later, from 1400 to 2008, the exhibition looks as a symbol of a fresh wish for a new European Renaissance. Avenue de l'Europe, Strasbourg 67.000, Fr. 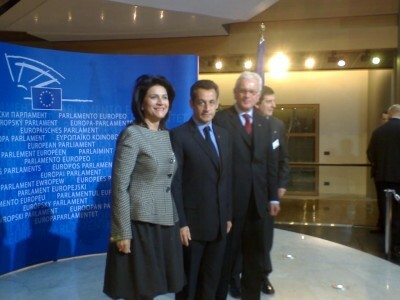 "Eurofora" has already been Accredited for Press coverage, inter alia, also by : EU, CoE, ECHR, ECB, OSCE, NATO, OECD, Vatican, UNO, G8-G7 + G20, etc., (including the French National Assembly and the German Bundestag, as well as the French Presidential Palace "Elysée", Prime Minister's "Matignon", and the German Chancellery, the Italian Foreign Ministry, etc), and has realized original Press Reports on the spot at many Summits of Heads of State/Government, as well as in some Ministerial Summits, at various Cities in Europe and in the World: F.ex. : in Paris, Berlin, London, Rome, Brussels, Strasbourg, Luxembourg, Geneva, New York, Copenhagen, Basel, Bonn, Frankfurt, Bratislava, Budapest, Reims, Marseille, Heiligendam, Elmau Castle (OberBayern), Deauville, Cannes, Freibourg, Offenbourg, Belfort, Epinal, Saint Dié, Nancy, Ludwigsburg, Baden-Baden, Mulhouse, Poitiers, Metz, Ludwigshafen, Brixen-Bressanone, Interlaken, Salzberg, (etc). + In Addition, "Eurofora" has been also officially Invited at various European/International Conferences/Events, (But not always available to accept ! ): F.ex., in Paris, Brussels, Offenburg, Monaco (Government), Luxembourg, Karlsruhe + Saarbrücken (Germany), Brno (Czech Republic/CoE), Lille, Strasbourg, Marseille, Bordeau, Finistère (Bretagne/France/COP21), Mont Saint Michel, Landau (Rhineland-Palatinat/Germany), Daugavpils (Latvia/CoE), Thessaloniki (University/Greece), Struthof (European Center of Deported/Resistants), Merignac (NoveSpace/ESA/CNES/DLR), Linas-Montlhery (5GAA: BMW/Ford/PSA+QualComm/Savari), Nancy (TPE/PME), Orleans (ARF), the French Senate, OECD, NATO/France, UNESCO, New York (Columbia University/USA), New Delhi (CyberLaw/India), Beijing (Economy ICC/China), (etc). 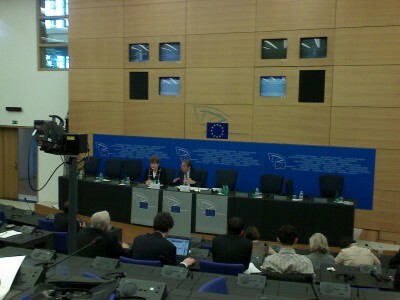 Strasbourg's potential for EU Citizens' links to European and PanEuropean decision-making can and must be developed, said in substance the City's Mayor in a Press Conference together with MEP Catherine Trautmann, his former collegue, t EU Parliament. - "I intend to work mainly along the line : "European Court of Human Rights and EU Parliament", Ries warned earlier "EuroFora", making more concrete his larger appeal "to the Peoples of Europe". He added now the EU Ombudsman, where EU Citizens can lodge complaints against alleged violations of EU Law, and he could also extend to the Shengen system, which serves EU Citizens' right to free and secure movement, both headquarted in Strasbourg. 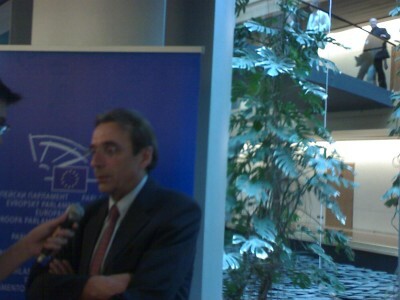 Meanwhile, Strasbourg's Mayor unveiled a colourful program of various events co-organized by the City during the French EU Presidency (July -December 2008), spreading from Media to Music, Science and research, Business and Development, etc.,...tastefully starting immediately with a .."European Food Festival", (that "EuroFora" regretfully had to miss because of an urgent trip to Paris, to prepare the EU - Mediterranean Summit of Heads of State and Government).. 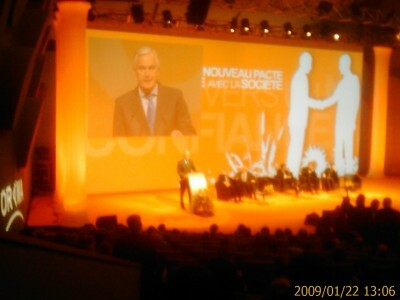 Regardless of normal national political differencies, Ries, (a Socialist for whom earlier rumours hinted at a possible Ministerial mission by President Sarkozy), "thanked the President for scheduling 3 official visits in Strasbourg" this semester (July, October and December 2008), and firmly reminded "Prime Minister Fillon's warning, recently in Holland, that France will never drop Strasbourg as Headquarters of EU Parliament's 12 plenaries each year : - "If anyone might ask to modify EU Treaties on this point, then, everything", including all other EU institutions' location in several EU countries, "will come also at the table for possible changes"..
- From more than +30 Countries (throughout Europe and from elsewhere accross the World). - Referenced (links) by many Medias Aggregators, European/International Organisations, and/or Universities/Educational Institutions, (etc). - (Original) News Publications : More than + 1.800 (Exclusive) Articles/News Reports, (All fully Web-Accessible). - Duration : More than a Decade+. It Exists since 2007, but really Started to regularly Publish "hard" News since 10.8.2008 (at Brixen-Bressanone, between Italy, Austria and Switzerland), and was Officially Registered on 1.2009. - MultiLingual "SEARCH" Engine, (Freely Available). + MultiLingual European FORUM for Readers' Debates, (attached and partly Linked. Due to be developed further asap). Russia - Georgia differend makes CoE re-invent Geography ! 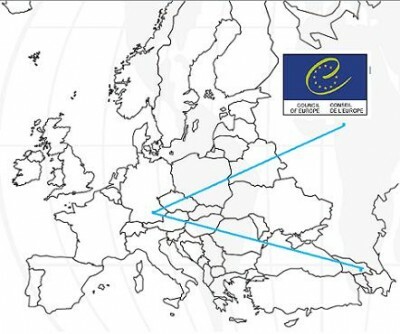 The recent Georgia - Russia crisis over South Ossetia had already an unexpected effect in Europe : It obliged the Strasbourg's PanEuropean organization, the Council of Europe (CoE) to start re-inventing functional Geography ! Astonished, but smiling CoE's Officials, revealed to "EuroFora", that a High-level group of Political leaders from its Parliamentary Assembly, who made an exceptional visit to Moscow and Tbilisi, as well as at S.Ossetia, at the eve of a rather "hot" session in Strasbourg next week, had to travel all the way back from Russia to .. Munich (Germany), in order to take another airplane for Georgia, because direct links between the two neighbouring countries had been "freezed" after the conflict ! 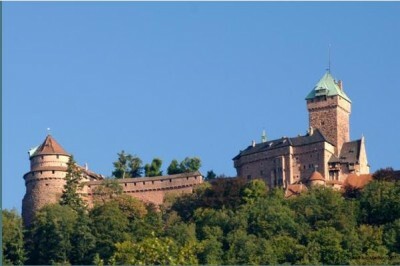 One of the results was that CoE Assembly's leaders were certainly glad to find Strasbourg's usual Sunday excursion to the best fresh air of the Alsace region : at the Haut Koenigsburg Castle, standing high at a pik of Vosges Mountains full of eye-catching views and refreshing oxygen, which celebrated its 100th Anniversary since being restored from the latest demolition, curiously provoked from an old miltary clash with a Swedish army, from the country which currently chairs the CoE ! 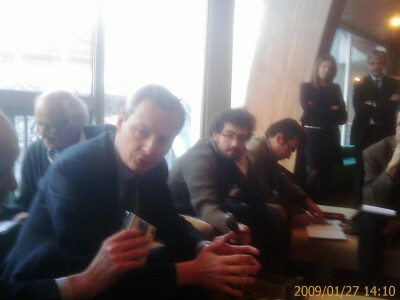 As a consolation, the Swedish President of CoE's Political Committe, Goran Lindbland, confirmed to "EuroFora" that he'd visit Haut Koenigsburg, peacefully this time..., but, in order to keep a cool atmosphere, he preferred to postpone for afterwards the formal anouncement of CoE group's visit to Russia and Georgia.. Recent Demands to freeze the credentials of Russian MEPs at CoE's Assembly, have stirred a controversy, which, according to some observers,might, eventually, spread also towards the credentials of the Georgian delegation, just coming back to Strasbourg from recent elections.. Unlike EU or NATO, CoE has no Money or Army to use as possible "Sanctions", (effective or threatened), and, therefore, it often uses its own existence, as a PanEuropean organization, in some "carrot and stick" moves : I.e. a country might be promissed to be given - or on the contrary be threatened to lose - Full or partial Membership, or a special Status, inside CoE, according to whether it complies, or not, to certain Criteria, and/or to the decisions taken by a Majority of other CoE's Member States.. The only one, among those Countries who are usually cited as "problematic" from the point of view of CoE's principles on Human Rights and International Law, to have escaped from such threats, until now, is Turkey : In 1994 - 1995, CoE's Assembly had initially adopted an "Ultimatum" asking Turkey to make substantial progres on Human Rights, Democracy, Cyprus' issue, the Kurdish problem, and the Aegean differend with Greece, etc, and giving Ankara a Deadline of 6 Months. 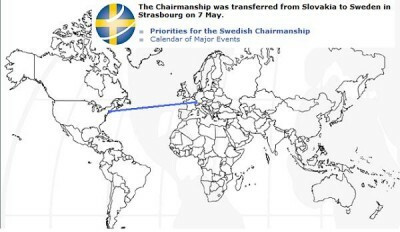 But, at this crucial moment, the over-active Swedish Foreign Minister, Carl Bildt, who currently chairs CoE's powerful Ministerial Committee, suddenly took another Geography-twisting decision : - Exceptionally, CoE's Foreign Ministers did not meet this week in Strasbourg, but at ... New York, on the sideliness of UNO's Assembly !.. In real practice, this exceptional New York CoE Ministerial meeting was inevitably transformed (at least partially) into a kind of ... informal Heads of State and Government Summit, since Foreign Ministers were, as usual, accompagnying their Presidents or Prime Ministers to New York..
Perhaps the Timing was not due to pure chance : Big Political decisions, usually dealt with at a Top level, have to be taken, indeed, next week at the CoE in Strasbourg on at least 2 thorny issues : The Russia - Georgia differend, and the Cyprus' issue, which inevitably relates also to EU - Turkey relations.. Both of great interest also to the USA and other Global players. Perhaps the people usually worried about how Strasbourg's airport might link with Brussels for EU Parliament - Commission transport, have seen nothing yet : CoE makes the challenge trans-continental !.. All Europeans, persons legally residing in the EU, persons or organizations affected by, and/or interested in European decision-making process, are welcome to take part into EuroFora's various activities, at the desired and appropriate level or form.